Dropshipping has been trending for sometime now. It typically is a supply-chain management system, where retailers or e-store owners do not physically store the products they sell. Instead, they just purchase the product online from a third party, and get them to ship it directly to the customers. In other words, these retailers or e-store owners never actually see or handle the products they sell ! Dropshipping is being used by several digital marketers who virtually connect with thousands of suppliers and wholesalers around the world, for buying the products on a wholesale/ minimum price, and then selling them for a profit through their own ecommerce stores. They completely avoid the hassles of maintaining a warehouse or shipping the orders. So if you have some money to invest, you can easily make a fortune through this way of business. Of course, you need to have an ecommerce store already set up before you can start. 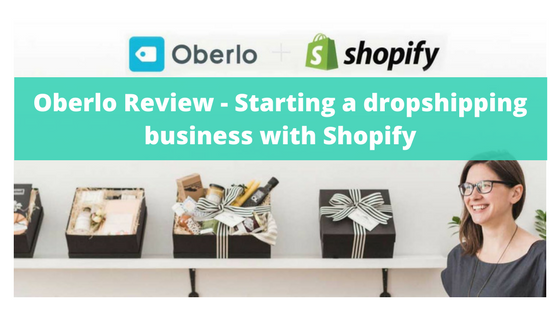 Let us review Oberlo, which happens to be the best drop shipping extension for all Shopify stores. Oberlo is a popular dropshipping app designed specifically for Shopify hosted sites. It specializes in simplifying the entire drop-shipping process in just a few clicks, making it easy-to-use even for the newcomers. Oberlo allows you to quickly import hundreds and thousands of drop-shipped products from the Chinese stores like AliExpress or Alibaba – directly to your ecommerce store. You can then create your own product-descriptions and setup the desired pricings for those products to be displayed on your site. 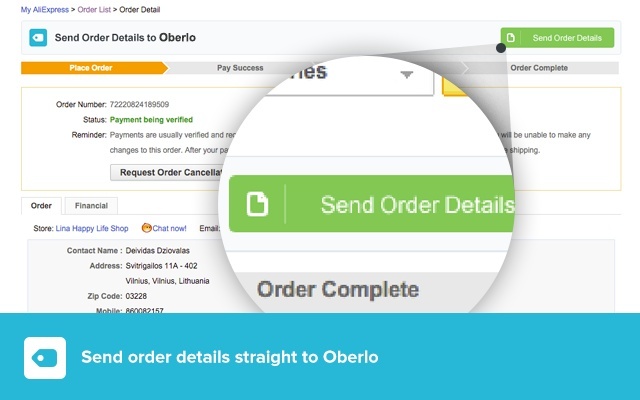 Once your order is ready to go, Oberlo handles the complete packaging and delivery of the orders to your customers, tracks the shipment status and even notifies them through emails. Oberlo extension can easily be downloaded and installed on your Shopify store. The dashboard provides a ‘Get Started’ section (where you can attempt to set up the pricing rules and install your first product), along with several video tutorials that explains how to use Oberlo. Oberlo gives you the access to thousands of suppliers along with their product details, product images and pricing. You can choose and switch between the suppliers most suitable to you. 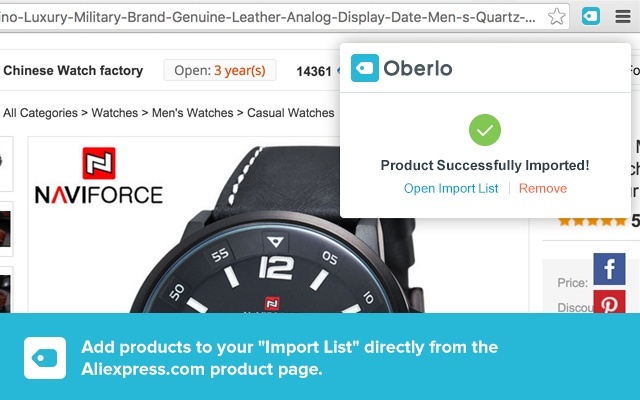 The Oberlo chrome-extension button allows you to easily import the products while browsing through the AliExpress catalogues. The Manage Product interface is simple and organized, and enables you to search and view your products, set your featured products, or import lists without difficulty. It also enables you to select the right kind of product for your store for generating maximum sales. Using the ‘Search Products’ tab, you can enter the right keywords and the categories (like price, score, volume-sold) from where you want to search the targeted products. You can even view the information about your sales and earnings for each product as well. This helps you get an idea about which product you need to add and which should be taken down. Apart from importing the products using this tool, you can also connect your ‘existing products’ (the ones you are already selling on your site) to Oberlo as well. It even offers you the ability to manage multiple wish lists and import products directly from there, while the ePacket Filter allows you to import products with the fastest delivery times. Setting the pricing manually for thousands of products can be painful. But with Oberlo, you have a complete control over your product price. You can either multiply the original AliExpress price or determine a Fixed Markup price. 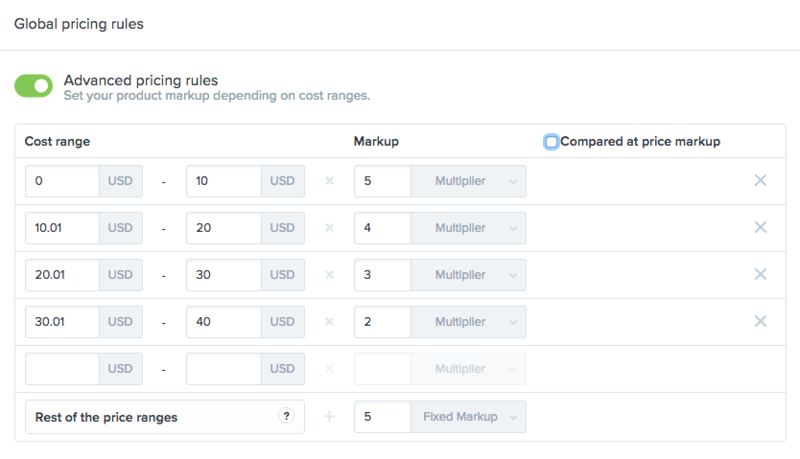 Advanced Pricing Rules can be applied to set up your own product margins across several cost ranges. And whenever an order is placed, you just need to search that product in your inventory and hit the ‘product order’ button and pay. Oberlo then automatically handles the rest of the order process that involves the packing and shipping of the product to your customers. Oberlo also keeps an eye on the product-stock levels, so that you don’t sell anything that is out-of-stock. It even notifies you of any change in the product-price from the supplier’s end. When a customer places an order for an item on your e-store, your store immediately syncs up with Oberlo. You just need to open the Oberlo dashboard, view your order list and complete the transaction for that item by hitting the ‘order button’ against that item. The rest is literally magical ! As soon as you click the order button, Oberlo opens up AliExpress (or the site where you imported your products from) and searches for the ordered item. It then adds the item to your cart and automatically fills up the name and shipping details (of the customer) and waits for you to press ‘BUY’. Once the order gets shipped to the customer, Oberlo then proceeds to update the order status on your e-store, notifies the customer about the delivery and even emails them the tracking number. Oberlo was designed for drop-shipping. So anyone who has dropshipping as a part of their business can install and sync Oberlo to their ecommerce stores. It saves both time and efforts of handling multiple orders and several form fillings. Oberlo Free Starter Plan includes all the main features like daily product synching, automated order fulfillment, free chrome extension etc. It allows you to list 500 items and sell up to 50 items per month, making it more suitable for the beginners. The Basic Plan ($29.90 /mo) provides a setup for 10,000 products and 500 orders per month and includes features like shipment tracking and orders monitoring. The Pro Plan ($79.90 /mo) provides a setup for 30,000 products with unlimited orders per month, plus multiple users and multiple sales channels. There is no fun in spending your entire day manually filling up forms, to order products on AliExpress. The ease of automation provided by Oberlo not only saves you the time, but also the hassles of processing hundreds of orders every single day. The easy-to-use dashboard and the multiple ways to import the products – based on price, volume sold per month as well as the scores, allows to you to quickly set up and expand your store on a daily basis. The flexibility of setting up your own pricing for the products, helps you generate easy profits. All this without having to worry about the order packaging, deliveries or even the follow ups with the customers. So, if you are seriously considering about drop shipping, then look no further than Oberlo – for your Shopify store.